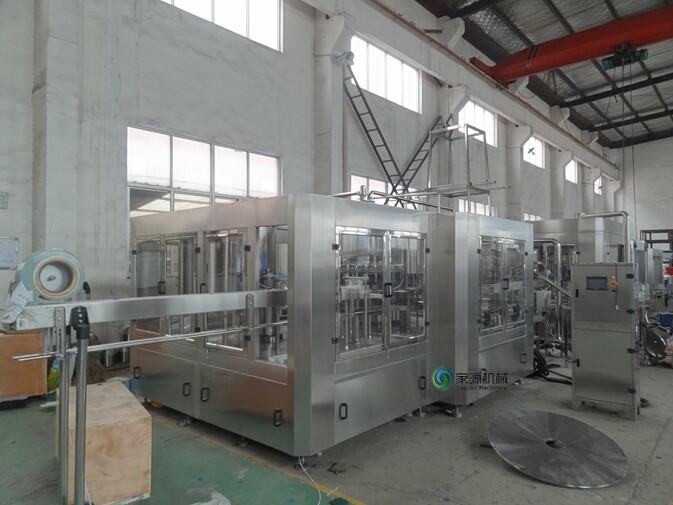 This CGF40-40-12 Wash-filling-capping 3-in-1 unit : Beverage Machinery is used to produce plastic bottled mineral water, purified water, and other non-gas beverage machinery. Mineral water plant machinery can finish all the process such as washing bottle, filling and sealing, it can reduce the materials and outsiders touch time, improve the sanitary conditions, production capacity and economic efficiency. integrates bottle washing, filling and capping into one monobloc unit. New designing filling valve, return gas and filling liquid are separate to ensure the filling materials is clean. The beverage filling machine adopt advanced magnetic clutch screw lid and the torsion torque is adjustable, so screwing is safe and reliable. High filling speed and mass flow rate, high precision of filling valve and control of liquids level is accurate and without loss. Double washing machine can make the bottle be well cleaned. Equipped with perfect CIP control loop and program and cleaning devices on the spot. Adopt the bottle neck clamping technology, do not need to change the height of the bottle, just change the parts which are relevant to the bottle diameter, such as arc guide plate, poking wheel etc. Adopting diaphragm adjust valve to control the inlet flow rate of liquids. It can keep the slight turbulence of liquids level in the solution barrel and ensure the accuracy in filling. It is adopted spiral descent fashion for the support plate for bottom of bottle at the outlet thumb wheel. It is not necessary to adjust the input height for exchanging bottle model. Perfect protection system to overload. Air control components are all adopted with SMC products made in Japan.